Info: When booking a telephone consultation, please give details to the receptionist BEFORE 10.30am. Any calls after this time will be put on the afternoon telephone consultation list. Please Note 2:00pm is the cut off point. Calls made after this time will be scheduled for the next day’s telephone appointment list. You have an on-going or non-urgent medical problem and you want to plan ahead to see the GP of your choice. Info: Routine appointments are booked at 10 minute intervals, but if you have a complex issue or multiple problems, we can offer you a longer appointment. 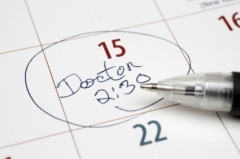 Info: Any Emergency appointment request for the same day will be telephone triaged by the Duty Doctor before an appointment time is allocated. Please call the surgery before 10:30am on 024 7645 7497 if you require a same day appointment. Practice Nurses have experience in managing minor illnesses and injuries, but are also trained to provide a range of nursing care including; dressings, contraception, chronic disease management, cervical smears, immunisations and vaccinations. Practice Nurses also offer advice on preventing illness through weight reduction, smoking cessation and other lifestyle changes. Please select the best option for you at the time, bearing in mind that accepting a telephone consultation will enable the GP to see people with more complicated and on-going problems. If you are unsure which option is best for you, ask the reception staff for help.